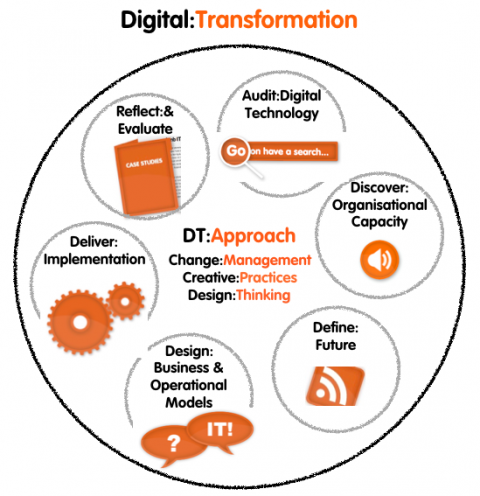 Our Digital:Transformation Approach created by Dr Hannah Rudman has been the core of £3.7m worth of national Digital Transformation programmes – for example, AmbITion Scotland. It has also been licensed by global technology solutions and consulting companies. Hannah works with all scales and models of business. We’ve worked with over 250 enterprises at C-suite level via our successful, internationally renowned Digital:Transformation Approach for organisational change. Integrating the opportunities of digital into an enterprise demands transformation across the whole organisation. Institutions wanting to remain attractive, engaging and resilient need to focus on developing new value propositions from digital and data innovations that customers and citizens want or need. Should your physical experiences, products and services be meshed with digital versions? Could your IP and data be released in innovative ways for extra value? Could your traditional value propositions be redesigned to meet new customer needs? to become agile and collaborative as a staff team, to develop new products, or services, or experiences. The Approach empowers enterprises to change to become resilient so that they can deal with ongoing digital disruptions (to markets, consumers, technologies, products, business models, etc). It comes from Hannah Rudman’s cross-disciplinary background of management consultancy, technology development, and creative practice, and is underpinned by Hannah’s academic research. Th report for Scottish Government, Distributed Ledger Technologies in Public Services that Hannah Rudman co-authored is based on a study of international best practice, including interviews with technology experts and local public sector agencies, and learnings from worldwide public sector implementations. Distributed Ledger Technologies – the next big Digital Transformation?